They "resisted" a team sent to restore order at the site, said Archievego Doe of the disaster management agency. Another official described the situation as "lawless". Rescuers have so far retrieved seven bodies after the walls of the pit caved in on 10 February. Liberian authorities deployed a team comprising the army, police, immigration and drug enforcement agency officials to the gold field in Nimba county, a major centre for illicit mining. The immigration services were involved in the operation because some of the illegal miners are foreigners, Mr Doe said. Thousands of people are believed to work in the mine, near the town of Tapeta. Aubrey Wehye, the district superintendent of the Tapeta region, said the situation was "lawless", adding that some of the illegal miners were in possession of "Guinean-made shotguns that they fire all night". 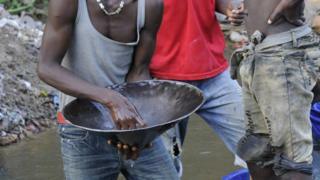 The illegal miners fear that the government wants to shut down their operations, says the BBC's Jonathan Paye-Layleh, who is in the capital, Monrovia. Poverty and a weak economy mean there is no shortage of Liberians willing to risk death in illegal gold mines, our reporter says. Miners have been searching for the dead and any survivors using their bare hands. Authorities now plan to use an earthmoving machine to widen the path to the mining pit so that an excavator can reach the site, Mr Doe told the BBC. He said the number of fatalities was likely to rise.